Dr. Stark uses advanced cardiac tests to diagnose and treat heart disease. 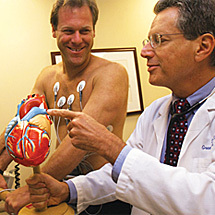 Dr. Stark performing cardiac stress test. Cardiac C-T angiogram provides vastly improved imaging of the heart muscle and coronary arteries. Painless and non-invasive. (Greenwich Hospital was the first in Connecticut to acquire this new technology). Convenient, miniaturized home heart rhythm monitor used to uncover the causes of dizziness, palpitations or fainting. Simple, non-invasive measure of heart function. 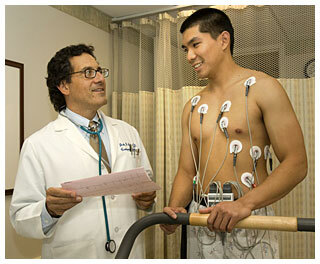 The patient walks on a treadmill while his EKG is monitored. Can indicate if there are blockages in the coronary arteries. Enhanced imaging of the heart using thallium, myoview or sestamibi cardiac tracers. Considerably more sensitive than a regular stress test. Using an ultrasound microphone that is guided over the surface of the chest, we can obtain accurate images of the inside of the heart. Extremely useful to assess the heart muscle, heart chambers and valves. 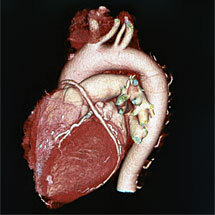 A non-invasive X-ray technique to visualize the coronary arteries. Can show even the earliest-stage cholesterol blockages, before they pose a threat. Accurate cardiac risk predictions are now available using simple blood tests. We currently monitor and treat LDL & HDL cholesterol, lipoprotein (a), Lp-PLA2, homocysteine, C-reactive protein and advanced lipoprotein fractionation. Modern antihypertensive agents and individualized regimens have enabled us to reverse even the most resistant blood pressure elevations. This has resulted in significant reductions in risk for heart failure, stroke and renal failure. Our office arranges tests and studies in accord with your availability and schedule. We review and explain your study results. Copies of your studies can be provided at your request.